Good news for konkan peoples, Maharashtra State Road Transport Corporation (MSRTC) department has started ‘Shivshahi bus mumbai to ratnagiri’ for Konkan peoples as inter-state connectivity service. 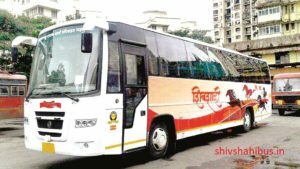 Shivshahi bus is a semi-luxury bus recently launched by state transport corporation. The Shivshahi bus will run from Mumbai Central to Ratnagiri and the fare of the buses will be Rs 556. Bus will leave from Mumbai central at 9:45 pm everyday and it will reach Ratnagiri at 7 am Next day. From Ratnagiri it will leave at 10 pm and will reach Mumbai at 7 am. MSRTC has a fleet of approximately 16000 buses. Ordinary passenger buses, semi-luxury buses, Volvo – B7R and Volvo B9R buses are a part of this huge fleet. MSRTC Volvo buses run between a large number of cities in Maharashtra.